The Western Folklife Center’s Media Producer Taki Telonidis and his production team recently returned from a 2-week shoot on the Blackfeet reservation in northern Montana for the documentary Healing the Warrior’s Heart, a public television special that presents a Native American perspective on both the soldier’s and the veteran’s experience. 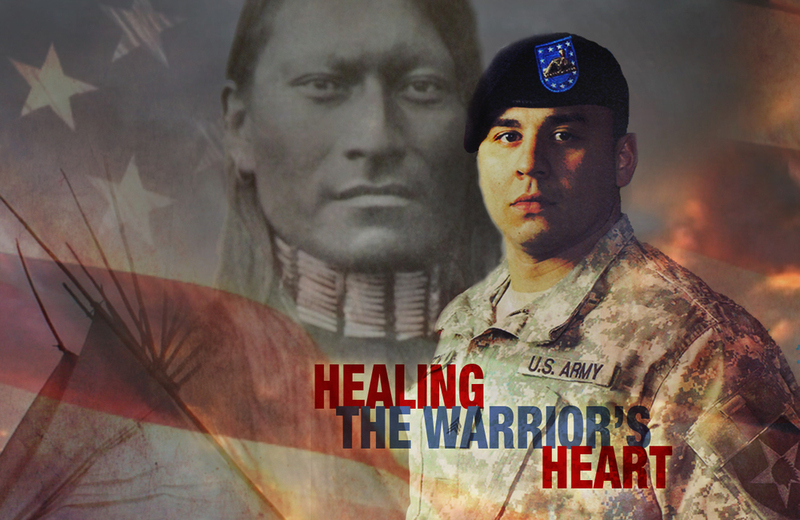 The program reveals the central role that military service plays in Native life and explores the spiritual traditions that help returning American Indian soldiers reintegrate into society and cleanse themselves of war. In addition to Taki, the production team includes partnering producer Gary Robinson, videographer Doug Monroe and sound engineer Paul Maritsas. This is Taki's first blog entry about his experience shooting the film. "The film shoot on the Blackfeet reservation was an intense experience, and one that served as a reminder of the poverty and tremendous need that exist among Native populations, as well as the power and hope that reside within traditions and spirituality. The Blackfeet Nation is a place where warrior identity is very much alive in our time, even though many current soldiers have lost the connection with the healing traditions practiced by their ancestors. Yet there are others for whom those traditions remain relevant both during their deployment and as they re-enter society. "We spent a couple of days with one young man named Martin Connelly who recently returned from Afghanistan, was suffering acute symptoms of PTSD, and is now finding relief through ritual and spirituality. It seems that warrior ceremonies at Blackfeet were largely ignored as recently as 15 years ago, but are now re-emerging as a result of the wars in Iraq and Afghanistan and the need to help soldiers who are having a difficult time when they come home. "We attended a sweat lodge for two returning veterans (one of whom was Martin), and witnessed an honoring ceremony for them in which an elder veteran/spiritual leader presented them with an eagle feather and warrior name, an important rite of passage for combat veterans. "We also conducted interviews with two directors at the Veterans’ Administration who’ve been instrumental in establishing Native Healing ceremonies at several VA centers including here in Salt Lake City. They expressed frustration with how slowly the VA system has incorporated Native healing into its programs, and also told us that they’ve documented a decrease in the use of medication by both Native and non-native vets who take part in sweat lodges and other Native ceremonies. "We did an interview with the head of the Crazy Dog society, who are the keepers of Blackfeet spirituality, and who include many veterans in their ranks. We were able to record some of the preparations for their annual Sundance or Okan. "In strategizing about what visuals could best accompany a section that discusses how the healing traditions of today are carried over from warrior history and ceremony that reach back hundreds of years, we decided to do a warrior reenactment with young riders from one of the local ranches on the Blackfeet reservation. After rain forced us to postpone the reenactment twice, the weather cooperated on the third day and we were able to shoot a very nice sequence of warriors going off and returning from war. Incidentally, this reenactment was organized by a veteran of Desert Storm and the 2nd Iraq war who was given the title of War Chief after his return home. "We came home from our trip with more than a dozen interviews, and well over 1,000 video clips which we are now labeling and organizing. Right now the thought of boiling down this mountain of video into a coherent story seems daunting, but most big projects feel that way in the early stages of editing." Healing the Warrior’s Heart is a production of the Western Folklife Center in collaboration with Tribal Eye Productions and KUED Channel 7, Salt Lake City’s PBS affiliate. The program will premiere in 2014. You can support this project with a stakeholder donation to Western Folklife Center Media Programs.